A space-saving essential for lil' ones' safety and comfort. 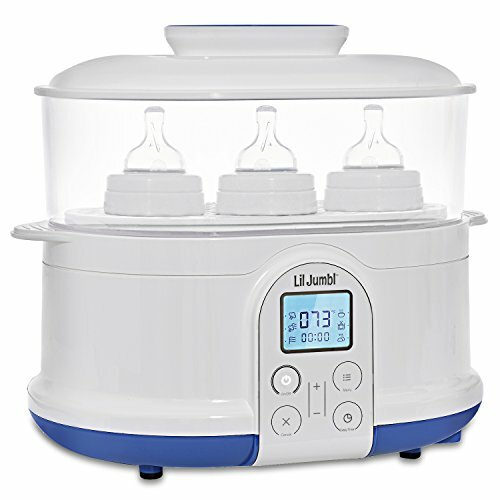 Keep baby healthy and satisfied with the all-in-one Bottle Warmer & Sterilizer by Lil' Jumbl. This multipurpose machine performs every diverse duty from sanitizing bottles and pacifiers to warming formula, heating food, and beyond. The electric unit uses all-natural steam to remove up to 99.9% of bacteria from infants' bottles, teething toys, utensils, and other accessories. The drying mode then kicks in to safely finish the job with the help of a built-in HEPA filter. Parents also enjoy utmost control with the sterilizer's adaptable compartments, intuitive LCD interface, and programmable delay timer. It's a steaming and cleaning wonder that feeds your parenthood confidence! Stay ahead of baby's feeding schedule with this multifunctional sterilizer and steamer. Mommies can effectively disinfect and dry bottles, steam food, and keep milk warm with one small but powerful device. Easily convert the adaptable base to prepare milk and formula, warm cooked food, or steam veggies for baby's enjoyment. You can even set a constant temperature to have warm bottles on standby. The device's easy-read LCD control panel displays current time, mode, and real-time temperature data [C°/F°]. Simply fill the unit with water, load items, program the timer, and relax while it works its wonders. If you have any questions about this product by Lil' Jumbl, contact us by completing and submitting the form below. If you are looking for a specif part number, please include it with your message.